Tactical Fiber Systems (TFS) has released a new fiber-based transmission system designed to transport video, audio, PTZ camera control signals and DC power over a single hybrid tactical cable up to 2,000 feet in length. Designed to facilitate video production in sports, racing, concerts, conferences, security and other venues, the PTZ CamLink 2000P includes a compact 7” square camera converter that transmits 3G-HD/SD-SDI video and mic level audio to a 1RU base unit, while receiving PTZ cameral control commands and DC electrical power. The compact camera module can be tripod mounted using standard hardware or located on a flat surface. PTZ cameras are attached to the camera module via a quick-release mount. Features include a sensitive shot-gun microphone with a 1/8” to XLR cable adapter to connect any microphone. The PTZ CamLink 2000 can be used for cable runs up to 20 miles via “dry” non-powered tactical cables but requires the camera module and camera to be powered locally by an AC/DC power supply or DC battery pack. “We developed the PTZ CamLink systems in response to the increasing popularity of PTZ cameras by producers to reduce production expenses”, said TFS President Rich Rubin. 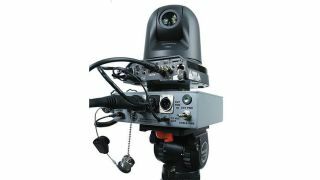 “The availability of quality PTZ broadcast cameras at very attractive prices has become a real game changer and we are pleased to facilitate long distance connectivity to these cameras,” Rubin added. TFS is marketing the PTZ CamLink and compatible TFS tactical fiber cables through its reseller network. All products are available for immediate delivery.